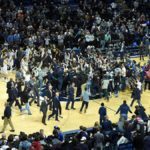 Jimmy Nash gives a recap of the most memorable games he has watched this year as well as a little look ahead towards March. 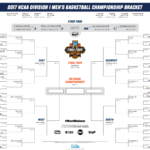 Pop on the television on any given weekday or weekend and chances are there is going to be an intriguing college basketball game on. When the academics are done and there is nothing else to do in the middle of the day or night, I often find myself partaking in the viewing of men’s college basketball. As I sat down to brainstorm ideas for this article, I thought about which games stood out to me. Without further ado, here are the ten most memorable games I have watched so far this college basketball season (in order of date played). The skinny: Not only are the IUPU schools my favorite group of satellite schools, they also have the most fun name to type. 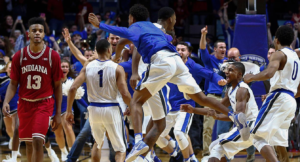 The Mastodons took down the Hoosiers in Fort Wayne and left everyone in awe. Indiana’s Juwan Morgan walks off the court as Fort Wayne storms it (Sports Illustrated). Obviously this was an early season hiccup for the Hoosiers, but for a team that is on the bubble like themselves this loss will come back to haunt them. The skinny: Both teams just ooze NBA prospects. This game was back and forth the entire way and the guard play was outstanding for both teams. Could this be a preview of a matchup in late March or early April? Only time will tell. 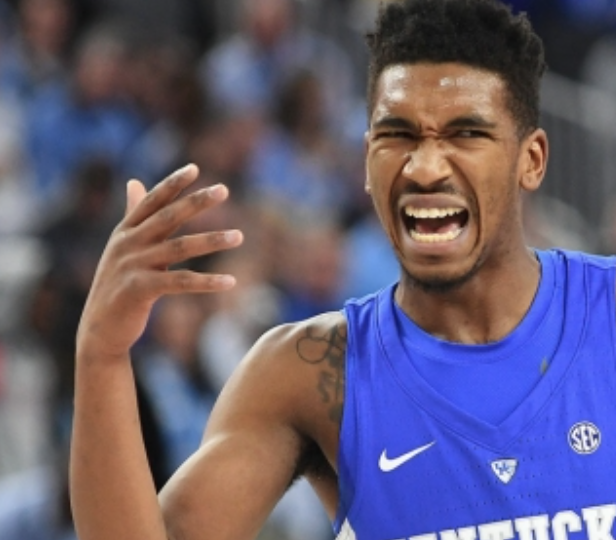 The skinny: Malik Monk proved to me that he is easily one of the best guard at this level by scoring 47 points. Kentucky has the young guns and North Carolina has the veterans. Those two recipes that have made up these two incredibly exciting teams to watch moving forward. The skinny: Villanova has a great backcourt in Jalen Brunson and Josh Hart. 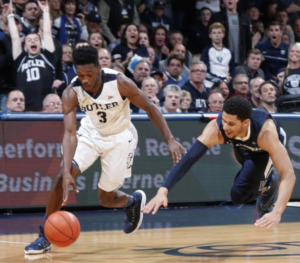 Kamar Baldwin dribbles past a diving Villanova defender (Joe Robbins Getty Images). The Bulldogs are everyone’s favorite Cinderella team a few years ago. The Big East is an underrated conference and it will be a dogfight to see who is on top of the standings at the end of the season (pun intended). The skinny: Arizona came into Pauley Pavilion and took care of business. They have the most underrated freshman in the country in Lauri Markkanen. With Allonzo Trier back from suspension, Arizona is going to make some noise and these two will be leading the way. The skinny: The score is not what I was interested in, it’s what comes after the game. West Virginia Head Coach Bob Huggins gets a $25,000 bonus every time he beats Kansas. While that is certainly a nice lump sum, Huggins donated this bonus to charity. 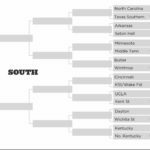 The Mountaineers are another team to look at critically when filling out your bracket. The Skinny: Iowa State is a team that just does not go away. They can score in bunches and hang around with the best of them. Not to mention, the Jayhawks had a 51-game winning streak at home. Playing in the toughest conference in college basketball, the Cyclones will be prepared for the Big 12 Tournament come March. The skinny: Oregon and Baylor have the most flourencent uniforms in the country and it’s not even close. Anyway, the Ducks have experience and have played well down the stretch in past seasons and have the right leadership in place to make a deep run. The skinny: After previously going 14-1 at the Kohl Center, the Wildcats get another resume boosting win. Sanjay Lumpkin drives to the basket on Wisconsin’s Ethan Happ (Chicago Tribune). They have been playing without starting swingman Scottie Lindsey for a little bit and have really clamped down on the defensive end. If you are a member of the Northwestern community, Selection Sunday could be Christmas in March for you. If I could watch every game, I would. Time does not allow me to do that. The rest of the season is sure to be all fine and dandy. March Madness is right around the corner. Boy, I can’t wait.